SAY HELLO TO BERKLEY! 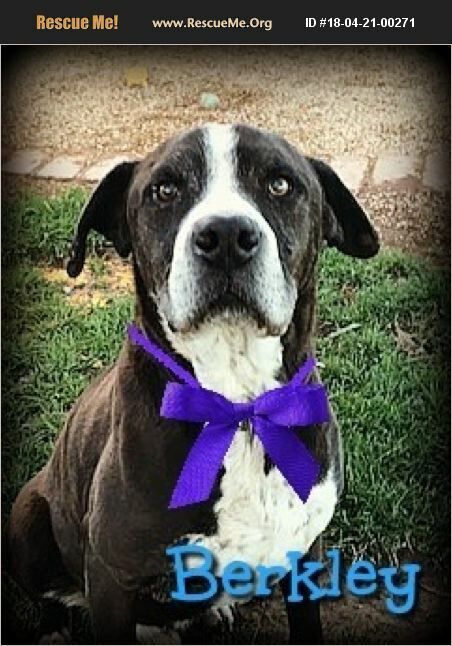 Berkley is a very sweet 10 years young Senior Pit Bull Terrier boy. Weighing in at a solid 65 pounds, this handsome boy is lovingly known as a ' Pit Tzu' here at the rescue! Berkley came to us through no fault of his own. He was surrendered to us by his owner because after 10 years, they've decided they 'just didn't want to take care of him anymore'. Berkley is a very low maintainance dog with no health issues other than a growth on his front leg that we were told he's had 'for years'. Our Veterinarian had a look at it and determined that it did not need to be removed. Berkley is sweet and gets along with most dogs as long as they don't challenge him by being rambunctious and pushy as Berkley is a low key kind of boy. What can we say about this wonderful boy? Well, he's both house and crate trained, very obedient and comes when you call him and knows the basic commands. He greets other dogs and people respectfully during his walks and rides well in the car and no one is a stranger! Berkley is not needy or barky. He can be independent and happy with his own company one minute and snuggle with you on the couch being a 'lap dog' the next. Did we mention he gives kisses, too? Berkley will sleep on your bed with you if invited and does not chew on anything not meant to be chewed. Berkley's ideal family will be one with adults or adults with older responsible and respectful kids 12 years and up. He would do fine as an only dog or with another dog that is similar in size, age and low key passive personality. Berkley is a shorter coated breed that will only require baths as needed and regular nail trims. Berkley's adoption fee is $ 150.00 This fee includes his Veterinarian Wellness checks while here at the rescue, his neuter, all vaccinations including rabies and bordatella, de-worming, microchip with lifetime membership and professional groom.